The United States used DNA testing to confirm assassination of al Qaeda international chief terrorist Osama Bin Laden. The United States used DNA testing to confirm assassination of al Qaeda international chief terrorist Osama Bin Laden by a team of U.S. special forces over the weekend. A team of U.S. Navy SEALs shot Bin Laden in the head May 2 after he refused to surrender at his mansion in Pakistan. According to a senior intelligence official who spoke at a briefing with reporters on condition of anonymity, the special forces identified Bin Laden by using facial recognition techniques. In addition, a woman believed to be his wife identified him by name during the raid. But a subsequent DNA test on Bin Laden's body also showed a “very confident match” against the terrorist leader's relatives, an intelligence leader told the Associated Press. The test showed “high confirmation” that it was indeed Bin Laden who had been killed, he said, thus enabling President Barack Obama to announce the death Sunday night. It is believed the U.S. collected samples of DNA from Bin Laden's relatives over the years following the September 11, 2001 Al Qaeda attack on America. The entire operation against Bin Laden was observed in real-time by CIA Director Leon Panetta and other intelligence officials, the source said. The monitoring was carried out in a conference room at CIA headquarters in Langley, Virginia. 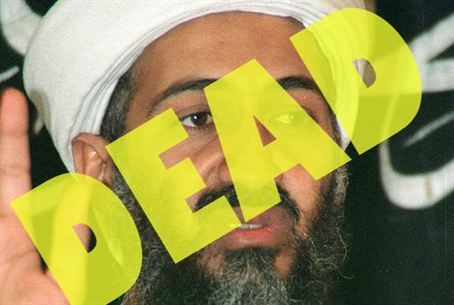 Bin Laden's body was buried within 14 hours in accordance with Islamic law, according to the Pentagon. The body was dropped into the waters of the North Arabian Sea from aboard the aircraft carrier USS Carl Vinson after undergoing traditional Islamic ritual preparation.